Kumquats, originally uploaded by schahn. When Dina and I moved to California, the first plant we bought was a dwarf kumquat. We planted it in an oak half-barrel, which, as an alleged byproduct of the wine industry, was another novelty. It survived years on our apartment’s porch, the move to our small house, and years more on the driveway. I couldn’t, however, resuscitate it from a summer of neglect caused by a renovation project. So, at the end of the past summer, we bought and planted a new dwarf kumquat. And waited. This morning, Benjamin and I went for a walk downtown. (7.36 km total, according to the phone.) On our way out, we noticed these two fruits on a limb of the tree. 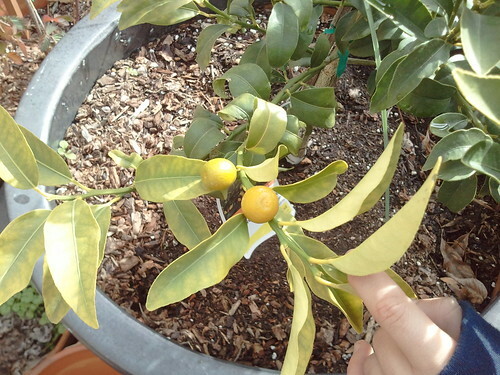 It’s a small first crop, but it won’t be long before I’m making kumquat-lemon marmalade again.